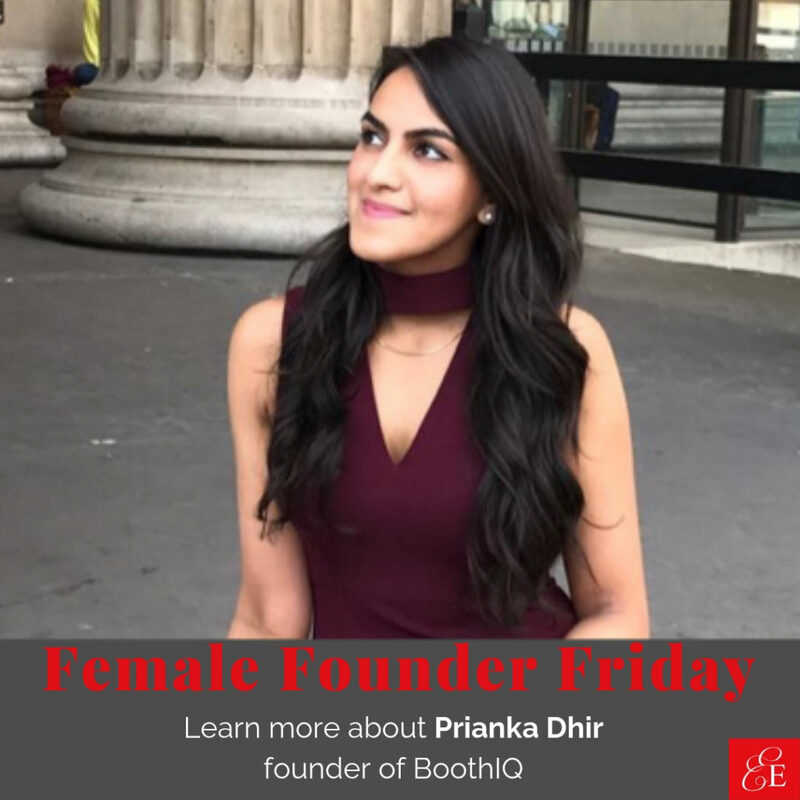 It’s female Founder Friday and it’s my pleasure to share the startup story of woman entrepreneur, Prianka Dhir. Dhir is the founder of BoothIQ, a web-based app that lists exhibitor promotions, contests, and special offers for attendees of wedding shows. Attendees can browse show specials, save customized lists of preferred vendors and show-wide promotions, as well as enter contests directly via mobile. I met Prianka at, you guessed it, a trade show. She was smart, articulate, and passionate about changing the outdated methodology used for data collection at trade shows. Of course I couldn’t wait to share her story and unique company in a feature! So… if you’re curious how one women is single-handedly disrupting the trade show industry with technology don’t miss Prianka’s startup story, how she overcame the “old school,” and advice for fellow female founders below! I launched a luxury trade show for women in Vancouver, BC when I was 22 and quickly learned that the trade show industry (specifically for consumer shows) was quite clearly stuck in the past. Technology had changed drastically, but for whatever reason, these changes weren’t reflected at all in the trade show industry. Businesses were collecting lead information on paper ballot sheets and attendees were forced to fill in the same data at dozens of booths across the trade show floor. Having launched my own trade show, I also realized that proving Exhibitor ROI was nearly impossible – and the brand exposure just wasn’t enough for businesses who needed real sales to justify the cost of participating. BoothIQ was created as a means to support exhibitors with mobile lead generation. By providing exposure to exhibitors taking part at the show on mobile, attendees could easily discover new businesses through promotions or special offers and businesses could collect more qualified leads based on genuine interest from potential customers. Consumer trade shows are old school, as paper is the primary tool for tracking lead data. The biggest resistance to change is from trade show participants who don’t understand the value new technology and tools can bring to their trade show experience. It was challenging to go against the grain to present a new way of tackling an old system, especially in an industry that is so traditional when it comes to marketing. Failures happen often – and that’s just part of the learning curve of any startup. In the initial stages of going from idea to business, we didn’t spend enough time on the launch of our website. We were so focused on making offline connections and the first few sales, that we didn’t focus enough on the look, feel, and branding of the business. BoothIQ was originally called Beyond the Booth, and although it was a good starting point, it didn’t really translate well for the audience. Since then, we revisited our branding and changing the name of the company was just the beginning. Running out of time. Sales in the event industry happen on a cyclical basis as there are busy show times and then busy selling times. Unfortunately, if we miss the boat on being able to sell to a show producer hosting a trade show in a specific month, we have to wait to work with that producer until the next event which could be months or even a whole year away. We’ve finally gotten to the point of being able to understand and get ahead of this cycle, but it’s still a lingering fear to have enough revenue for stable cash flow throughout the year. To be honest, BoothIQ is currently focusing on the present. We have a road map of where we see ourselves going, but we’ve been focused on mastering one vertical at a time and then growing the business to support other consumer trade show verticals. We’re currently focusing on and starting to see success in the wedding show market which has been really rewarding! In the age of social media where everyone is “living their best lives” and posting their (often unrealistic / exaggerated) successes – it’s hard not to make comparisons with where you’re at with your own goals. One “hack” I’ve found to help with this is following specific female business owners and influencers I look up to who share their daily startup stories on a regular basis. Being an entrepreneur can be isolating at times and sometimes it’s honestly just helpful knowing you’re not alone in the journey. It’s important to create a community both online and offline where you feel both supported and inspired. Have an appetite for learning. The startup journey is filled with amazing lessons if you’re open to looking for them. Give yourself the opportunity to learn from others, open yourself up to new and different experiences, and learn from both your failures and your successes.